It’s hard to believe that water — the solvent we use to remove many stains — can cause stains itself. Whether they’re from minerals in the water or dirt in the carpet or upholstery, water stains can (surprisingly) be removed by using water! Read on as our experts tell you what to do. Debra Johnson, cleaning expert and president of Merry Maids, shares these tips for removing water stains from clothing. Spread out a clean white or light-colored towel on an ironing board. Place the clothes with the water stains face down on the towel. Moisten the stained area thoroughly using a clean, wet microfiber cloth. Use an iron to dry the dampened area. Ensure that the iron is set to the appropriate setting for the fabric. Make sure that the stained area is completely dry before proceeding. Repeat the process: Move the stained area of the fabric to a dry portion of the towel, and dampen the area using a clean, wet microfiber cloth. Use the iron to dry the area. Repeat until the water stains disappear completely. A slight ring may remain after the water spots have been removed. In this case, turn the fabric right side out, and use the back of a spoon to rub the affected area until it disappears. Johnson also offers this easy solution to water stains on upholstery. Mix 1/2 cup of vinegar with 2 cups of water in a spray bottle. Test the solution in an inconspicuous area. If the solution causes additional spotting, try using distilled water in the bottle without adding vinegar, and repeat the test in another inconspicuous area before spraying the water spot. Lightly mist the stain. Begin at the outer edge of the spot, and work in concentric circles toward the center. Use a white microfiber cloth to blot the stain gently as you spray it. This also prevents the solution from wetting the padding below the surface of your furniture. Continue to spray and dab the spots until they disappear. Aim a fan or hair dryer at the damp spot to speed up the drying process. Keep the fan blowing on the area until it is completely dry to prevent mold or mildew growth. Dmitri Kara, from Fantastic Cleaners located in London, removes water spots from the carpet by using two methods. Method 1: Treat the stain by dabbing with a solution of either 1 cup of water and 2 ounces of distilled white vinegar OR 1 cup of water and 1 teaspoon of dish detergent or soap. Work from the outside of the stain and move toward the center. Then, rinse the stain by dabbing with a clean, wet cloth and blotting with a dry cloth to absorb as much moisture as possible. Method 2: Steam the water stain using a steam cleaner, a fabric steamer or even a steam iron turned to the lowest setting. Apply the steam for a minute or two, depending on how bad the stain is. (Never apply the iron directly, says Kara, or you might ruin the carpet.) Lastly, blot the area with a clean, white towel to remove moisture and all traces of the stain. Repeat as needed. 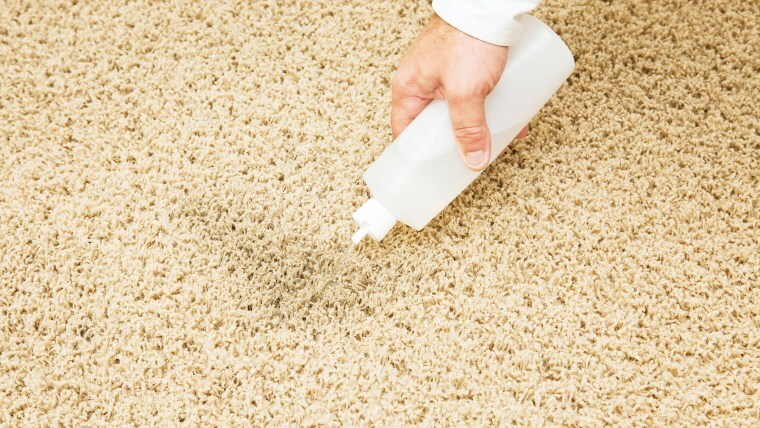 If the stain persists, contact a professional carpet cleaner. See, water isn't so scary!